How Many People Die From Terrorism? Last year, more Americans died from dog bites and lightning strikes than terrorism. You are also generally more likely to get killed by bathtubs, vending machines, and beestings than by terrorism. For the lifetime odds of dying from various causes, see this handy chart. 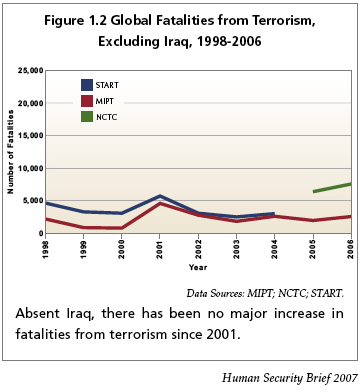 According to a 2007 Human Security report, there has been no major increase in fatalities from terrorism since 2001 (as long as attacks in Iraq are counted as civil war casualties). Americans’ fear of terrorism is fading: 36% believe that “there will be another terrorist attack on the United States in the next few months,” down from 62% in 2006. Terrorists apparently don’t believe in analytics, or they would choose other tactics. According to Audrey Cronin, 94% of the terrorist groups she studied fail to achieve any of their strategic aims. Terrorist groups only survive 5 to 9 years – much less than the lifespan of the organizations they are opposed to. And as terrorists escalate their tactics, they get more attention, but supporters are repulsed, withdraw their money, their safe havens, and their reluctance to cooperate with the police. For example, Osama bin Laden’s support declined significantly over the last decade, according to the Pew Research Center’s Global Attitudes Project. Commonly established facts aren’t enough to sway some people. According to the latest Pew Poll, most Muslims in the nations surveyed did not believe that Arab groups were responsible for the 9/11 attacks on the US. And, to a lesser extent, this is true of other countries. In 2007, 33% of survey respondents said they believed that Saddam Hussein was personally involved in 9/11. In 2004, a survey found that 49 percent of New York City residents believe individuals within the US government “knew in advance that attacks were planned on or around September 11, 2001, and that they consciously failed to act”. What’s the ROI of Anti-Terrorism Security? According to a new book, homeland security would have to foil 1,667 Times Square-style attacks every year in order to justify the $75 billion in increased spending since 2011. Security costs have risen worldwide: for example, airline security costs in France have risen from €140M in 2001 to €640M in 2011. All the extra waiting in line to participate in security theatre has a cost: if you assume that an hour of a business person’s time is worth $50, and everybody else $15, then the extra wait times costs about about $8bn annually. Non-financial costs: it’s estimated that between 2001 and 2003, enhanced airport security lead to an additional 2,300 road fatalities that would not otherwise have occurred. According to the US Travel Association, the US’s market share of global tourism dropped by almost one third from 2000 to 2009. That means 2.4 million fewer visitors in 2009 than at the beginning of the decade. Foreign tourists bring in US$120 billion to the US economy. The business makes up eight percent of the US’s overall exports, or one quarter of all exports in the services category.